The sister’s ethos is ‘less is more’. They keep it simple from the ingredient list right through to the packaging. The production process is also very simple, just like it was when they were growing up. The fudges are made in open pots and each small batch is hand beaten. This gives the Melting Pot fudge its uniquely smooth and creamy texture. They come in a range of 14 flavours. All the flavours are natural and contain no artificial flavours, additives or emulsifiers. Ten of these flavours have won Great Taste Awards. 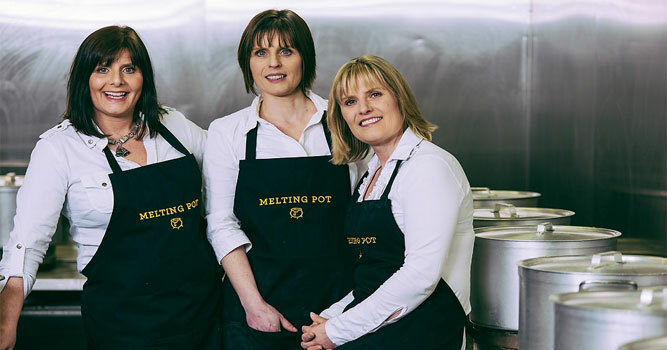 The sisters feel that their success is because they stay true to their roots, they only want to make fudge but make the best fudge possible. Manufacture gourmet handmade fudges in a range of natural flavours. Their range of fudges is available in a selection of pack sizes and are ideal for the gift market, trade, wholesale, retail and corporate customers. They also make a range of own label fudge and bespoke flavours for many recognised customers.